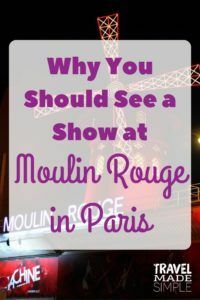 Going to see a show at the Moulin Rouge wasn’t something I thought I wanted to do. But I’m so glad my best friend wanted to go, because it turned out to be an amazing experience. 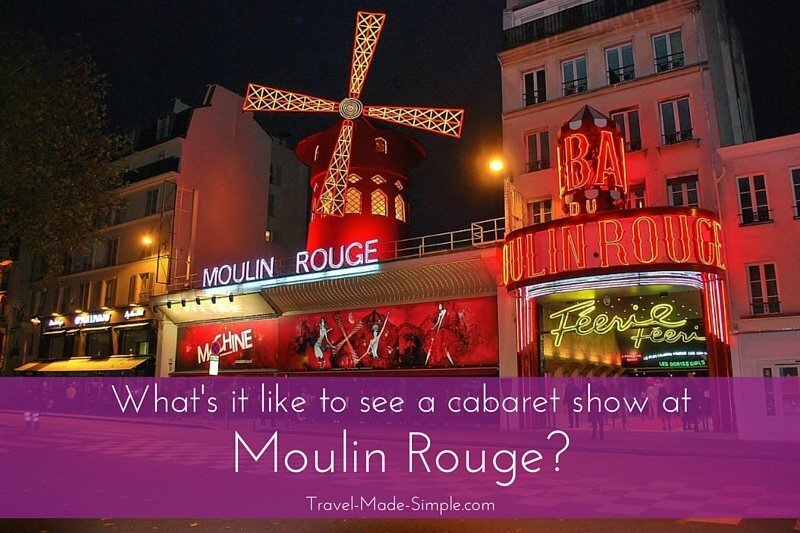 The Moulin Rouge cabaret is definitely a must-see show when visiting Paris. 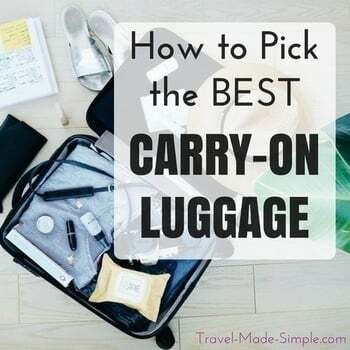 Here’s why you should go. I know you’re thinking, why were there animals in the cabaret show? It was a bit unexpected, I’ll admit. At one point a group of women came onto the stage with ponies. It was part of the skit, and luckily there was nothing too weird about it. The more impressive animal-related act was when a pool of water came out from the stage, and it had snakes in it. A woman danced on top of the pool at first, but then the top retracted and she hopped in. With the snakes. 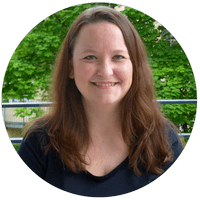 She swam around with them and had a few looped around her shoulders, neck and arms. I was really just expecting singing and dancing at the Moulin Rouge cabaret show. As I’m sure you’ve guessed from the section above, there was so much more to it. One of my favorite parts was a couple on roller skates. They skated on a very small round platform, and after a few minutes they had a leather strap around her head and his neck, attaching the two of them together. He flung her around at top speeds, and I’m sure one wrong move could’ve resulted in her breaking her neck. It was a truly amazing performance. Later another couple got on stage and danced on a similarly small platform. There were no roller skates this time, but more elaborate dance moves. This woman was also hurled through the air in crazy manners and at warp speed. My friend lives in Las Vegas and has seen Cirque du Soleil, and she said Moulin Rouge was crazier. You know, in a good way. >>Read about taking a Loire Valley castles and wine tasting tour from Paris. It really is an impressive place to see a show. Although the building is not the original (it was burned down in the early 1900s) the theater has existed in some form for well over 100 years. It’s big enough to handle a large crowd but not so big that you can’t see the stage. Most people are seated at tables since there is a dinner option. The Moulin Rouge dress code for spectators is not too strict, but they do not allow shorts, jeans, or sneakers. I wore dress pants and a cute top, but many people were even more dressed up. There is a coat check where they will also hold your bags. This is convenient for those of you who are sightseeing in Paris during the day and need to change clothes before the show. Unfortunately they do not allow photography inside. But there is a professional photographer walking around who will take your picture, which you can later purchase. We did this, and the photo came with a couple of matchbooks with our faces on them. I thought it was a bit overkill, but I guess it’s a nice touch. Since seeing a show here is such a popular activity, you need to book your Moulin Rouge tickets ahead of time. They have several options, but I’d recommend either the VIP Moulin Rouge tickets or the three course dinner option. We booked the VIP option, which came with skip-the-line access, champagne, and a little bag of macarons, plus a few trinkets like a keychain. I went into this night thinking it would just be a cheesy song and dance show. 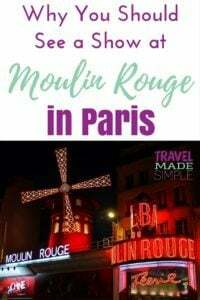 It ended up blowing my mind, and the Moulin Rouge show was one of the best things we experienced during our week in Paris. Book VIP Moulin Rouge tickets here. 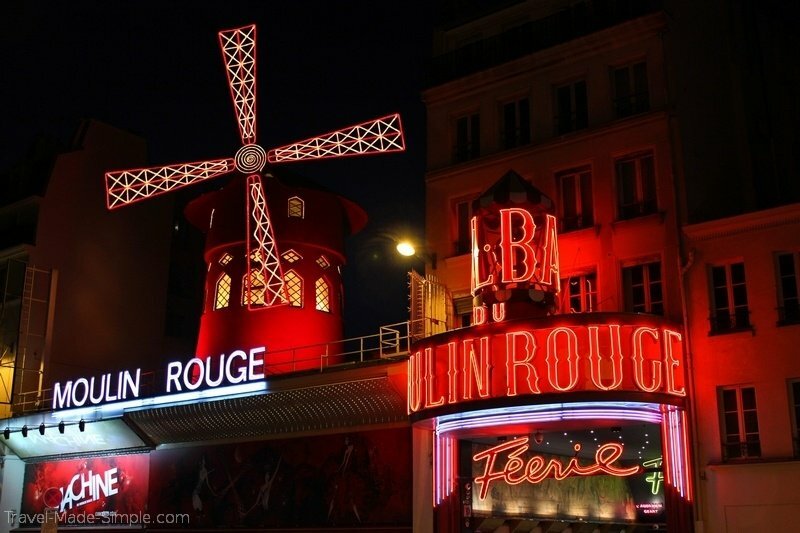 Book the dinner and show Moulin Rouge tickets here.